In July and August of 2002 we traveled from Las Vegas, NV to Alaska and back. Two months and 9000 miles. We had a great time but were really ready to sleep in a bed that did not move by the time we got back. We traveled North up Interstate 15 from Las Vegas to the Canadian Border and then to Calgary, Alberta where we took in the Calgary Stampede. We had a 26 ft Wilderness RV trailer pulled by a Dodge Durango equipped with the V8 engine and auto Trans. We had one problem, 90 miles from home on the 4th of July. The day we left. Large amounts of Smoke coming from under the Durango and when we stopped, it would not move any further. Tow truck came out, loaded the Durango on the flat bed, hooked the trailer behind and delivered us to an RV Park in St. George, UT and the Durango to the local Dodge dealer with a note under the wiper with our cell phone nr. We had the transmission serviced just before leaving and the dealer had not reconnected one line security. It had blown off and sprayed transmission fluid allover the cat converter. Lucky no fire or our trip would have been cut short. The dealer in St. George found the problem and had it fixed before I even called him the next morning. They picked us up and we were on our way by 9AM. After enjoying the Calgary Stampede we headed for Banff and Jasper National Parks. This is Lake Louise in Banff National Park. Yes, that is an ice berg floating in it. There is a glacier at the far end away from the lodge that breaks off(calves) into the lake. The staff has a pool going as to when the next berg will calf from the glacier. This is Mile 0 of the Alaskan Highway in Dawson Creek, BC. traveled with the group throughout Alaska. Highly recommend doing so for anyone on their first trip. Following the Alaska Highway we traveled from Dawson Creek to the Yukon Territory frontier. Then back into the USA and Alaska. Yes, we had to clear US Customs at the Alaskan border. Raisen, our chocolate cocker spaniel, went with us on the trip. We crossed many graceful bridges. We saw numerous streams and rivers. The one on the right is the Yukon River. We took a river boat ride up it just like the Gold Rush miners did. they just called it Chicken instead. And the famed Alaskan mosquito. Actually we had very few of them. Sea otters and sea lions kept us amused on a cruse to a ocean fronted glacier. 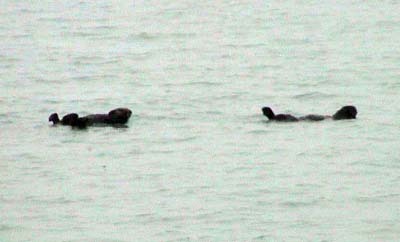 Orca whales were hunting in this area but the otters did not seem concerned. 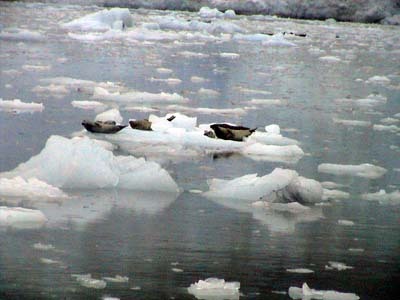 The sea lions stayed safely on ice bergs to avoid becoming a meal. These mountain goats appeared to be eating gravel but we realized they were licking up salt that had been spread on the roads during the winter. This moose calf and its mother greeted us when we returned from a performance at a local theater around midnight. This photo was taken in natural light. No flash. Remember this is the land of the midnight sun. We were high on a road on the side of a mountain when we saw this caribou (Reindeer) running in the stream below. Apparently they run in water to keep the biting flies off. The water splashing up discourages the flies. This is Mt. McKinley on a rare day that it was not obscured by cloud cover. Mt. 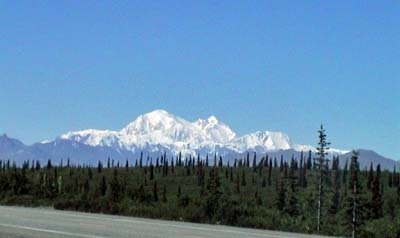 McKinley has a summit elevation of 20,320 feet above sea level, making it the highest peak in North America. This photo was taken in Denali National Park. McKinley again against an unbelievable clear blue sky. Some of the flowers we saw during the trip. There were not al that many. One of the many glaciers we saw. We actually got to walk on one after we had been taken up on it by snow cat. Some of the people were drinking the melt water but we decided that we did not want any million year old microbes going down our throat. We learned later that some people do actually get sick from drinking such water. Some of the icebergs in the Arctic Sea were this blue. This is the actual color with no “photo-shopping done to the photo. For those with a scientific bent, click here for more “Blue Iceberg” info. It seamed like we found a new lake around every turn in the road. Each one more beautiful than the last. And if it wasn’t a lake, it was a graceful waterfall. Yes, there is gold in Alaska. Ms Skunk has a pair of earrings filled with gold dust the Skunk panned from one of the streams. Unfortunately we did not find anything this big! Yes, we did get some rain. In fact, quite a bit of rain. This is the grave of “Soapy” Smith. One of the greatest con-artists in the Klondike. He operated out of Skagway. He was so slippery, the town elders would not allow him to be buried in the town cemetery. He is buried just outside its border. For a more detailed history of Soapy click here. 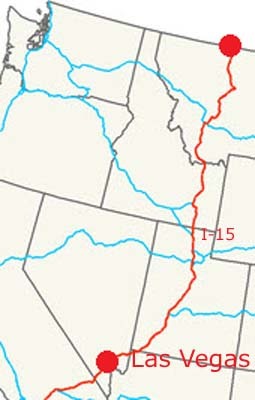 Parts 3 and 4 deal directly with his activities in Alaska. These photos are of a grizzly fishing for salmon. The splashes around the bear are salmon trying not to become lunch. We were on an elevated observation deck so we did not become dessert. I was surprised to see that grizzlies come in many different colors running from blond to black. This is Fish Creek in Hyder Alaska. The only way to get there is through Stewart BC, Canada. This ends our Alaskan Odyssey. Click here to go Home.